Sorry, Secret Wars. In the inarguably best comic news of the week, original co-publisher Derek Dingle, along with writer/producer Reggie Hudlin and artist Denys Cowyn, is resurrecting the late Dwayne McDuffie's Milestone Media, best known as the home of beloved character Static Shock. Most comic fans know McDuffie's name, and how he died in 2011 at only age 49. Before his death, he was a prolific writer of comics and animation (he wrote many a great DCAU episode) but also formed Milestone with Dingle in an attempt to bring diversity to superhero comics. 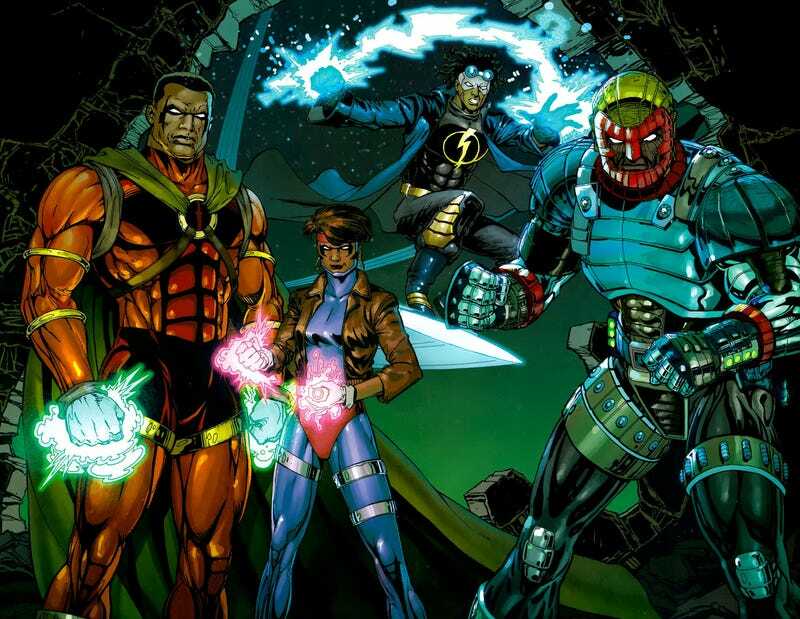 He created or helped create heroes like Static, Hardware and more, and Milestone was absolutely the preeminent black comics company before it shut down in 1997. According to the Washington Post, Dingle, Hudlin and Cowyn have brought back Milestone Media as a way to honor McDuffie, as well as continue his work. But they want to do far more than just trot out the publisher's classic characters. Yet Cowan says that putting a character of color in a well-known, previously white mantle doesn't hold the same impact as creating a new wave of heroes for an ever-diverse readership and new generations of fans. "There are all kinds of challenges that are facing people of color — that part hasn't changed," Cowan tells The Post's Comic Riffs. "What has changed is, there are a lot more characters of color in comics. What we feel is now, Milestone is necessary because of the types of characters that we do, and the viewpoint that we come from." There's no set date for Milestone's officially return to comic stores, but Dingle and the others hope to have some news for this year's Comic-Con. If you have the time, I highly recommend you read the Post article about the new Milestone and Dwayne McDuffie's legacy — and why the publisher's return is such good news indeed.